West Routt Fire Protection District firefighters in Hayden rescued this dog that fell down a well. 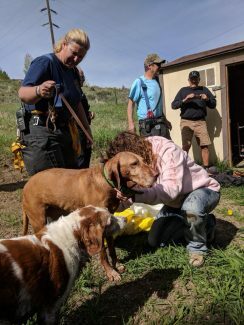 STEAMBOAT SPRINGS — West Routt Fire Protection District firefighters rescued a dog that fell 8 feet into a well Friday morning. The dog’s owner saw the dog fall through a hole in the floor of the pumphouse at Hayden Cemetery, and he called 911. The dog fell into 4 feet of water at the bottom of the well. One of the firefighters went down into the well using a 10-foot attic ladder. He was able to tie a rope around the dog, and it was hoisted up to safety. Aside from being a little cold, the dog was uninjured. Leck said he didn’t know the breed of the dog. The Hayden Police Department and Routt County Communications assisted with the rescue. Leck said Hayden’s animal control officer was a huge help to the firefighters. “She gave us help on how to handle the situation,” Leck added.